The Tim Campbell Retro Experience! Tim Campbell is a natural all round entertainer. He sings, acts and hosts with an easy knock-about warmth and infectious style. Tim is most well known on Australian TV in the role of ‘Dan Baker’ on Seven's Home & Away. Previous to this also starred in Big Sky (Ten) Snobs (Nine), Dead Gorgeous (ABC) plus guest roles in Wildside (ABC), Sea Patrol (Nine) White Collar Blue (Ten), Always Greener (Seven), McLeods Daughters (Nine), Police Rescue (ABC), Water Rats (Nine), Australians At War (ABC), . He also appeared in the American series of BeastMaster and The Lost World and in US movies Dynasty Behind The Scenes and The Great Raid with Benjamin Bratt and Joseph Fiennes. 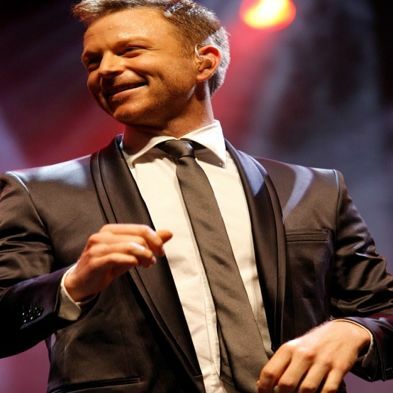 As a singer, Tim has performed in various productions around Australia, Asia and the Middle East, including his memorable appearances at Carols In The Domain, Perth Telethon and The Good Friday Appeal for Channel Seven and Carols By Candlelight for Channel Nine. In the corporate scene, Tim has kept audiences entertained and clients more than satisfied including Toyota, Westfield, Nestle, Volvo, KPMG, Crown Casino Australia, Coca-Cola, Aussie Home Loans, Youth Olympics Committee, Heloise Waislitz, Racing Victoria and many more. Be it as an Emcee, feature vocalist or with his band The Tim Campbell Retro Experience, Tim leaves his audience excited whilst successfully delivering a client?s brief. Not content with all his TV and live performance work, Tim ventured in to the world of musical theatre in late 2007, playing the role of ‘Roger’ in the Perth season of RENT and in 2008 moved to Melbourne to take the lead role of ‘Johnny O'Keefe’ in the reprised musical of SHOUT! THE LEGEND OF THE WILD ONE, playing at Melbourne's State Theatre and at Sydney's Lyric Theatre during 2008. Critics raved about Tim Campbell as Johnny O'Keefe in SHOUT! "Tim Campbell plays Johnny O'Keefe to perfection." "From what I saw today it is clear that Tim will be the next big star of Australian musical theatre." "Tim Campbell sings better Johnny O'Keefe songs better than J. O'K did!" "Tim Campbell reveals a huge depth of talent in the demanding role of O'Keefe." "Tim can really sing, sing, sing!" "It's the passing of the baton from one rock generation to the next, because Campbell is a terrific J.O’K. " In 2009, Tim signed with The Production Company for their musical The THE BOYFRIEND, starring alongside Rhonda Burchmore as ‘Bobby Van Husen’. In 2010, Tim moved into The Capitol Theatre to join the Sydney cast of WICKED, including Bert Newton and Maggie Kirkpatrick, to play the love interest of the two witches – ‘Fiyero’. From TV drama, to stage, to hosting national network television, Tim continues to entertain and excite audiences across the nation. He looks forward to helping be a part of your next successful event.